Improving the efficiency of the fight against corruption and strengthening of mechanisms for corruption prevention are the most important goals of the Law on organisation and jurisdiction of government authorities in suppression of organised crime, terrorism and corruption. The topic was the subject of a discussion held in Nis, attended by the Head of the EU Delegation to Serbia Ambassador Sem Fabrizi and Serbian ministers Nela Kuburovic and Nebojsa Stefanovic, and Head of the OSCE Mission to Serbia Andrea Orizio, on the occasion of the first year of enforcement of the Law. The European Union provided financial support for the project on corruption fighting and prevention. “I am very happy to be here today to talk about the results achieved in enforcing the Law on organisation and jurisdiction of government authorities in suppression of organised crime, terrorism and corruption. The Law, along with the entire legislative and institutional framework, is one of the strongest tools Serbia has at its disposal in fighting this scourge in an efficient manner,” Ambassador Fabrizi said. Since the enforcement of the Law, Serbia has nearly set up the institutional framework and the system has started to yield results, the Ambassador said, adding that fight against corruption is one of the most relevant issues in every country. “The EU is set to secure additional support for Serbia’s government agencies in fighting against corruption. Serbia has a solid Strategy but it is important for the government to establish a functioning system. The EU is your ally in this endeavour,” Ambassador Fabrizi stressed. Speaking about corruption, the Ambassador compared the issue with cancer, saying that the slow onset, with symptoms that seem unrelated, can quickly escalate and turn into a systemic hazard that can seriously hurt the society. In order for the state and the society to really face corruption, it is necessary to apply a long-term, complex, and committed approach, the Ambassador said. The role of the Ministry of Justice of the Republic of Serbia is to secure a normative framework, offer new methods and tools in order to help institutions in fighting corruption and organised crime. 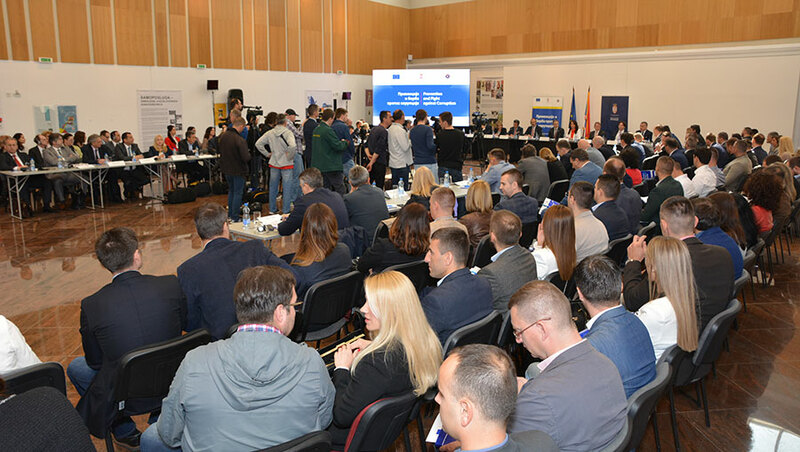 According to Minister Kuburovic, significant progress has been made when it comes to improved cooperation among all relevant organs and institutions, by creating a network of liaison officers from 13 relevant institutions each of whom have undergone specialised training. “This year was challenging for all of us. A year has passed since the enforcement of the Law began and I can say that the first steps have been successful,“ Minister Kuburovic said, noting that thanks to the Law, 448 rulings have been handed down, 444 out of which were convictions, while the majority of sentences also included prison time. Minister of Interior Nebojsa Stefanovic commended the work of the Ministry of Justice for enforcing the Law and thanked the EU for its support. “The state recognizes the need to wage a systemic fight against corruption. A systemic fight means that all institutions are actively engaged in the process,” Minister Stefanovic said. Head of OSCE Mission to Serbia Andrea Orizio noted that the OSCE – working in close partnership with Serbian institutions – supports the efforts Serbia is making in fighting corruption, organised crime, white-collar crime and terrorism. “OSCE Mission will continue to boost the capacity held by judges, public prosecutors and police officers in the area of investigation, bringing indictments and handing down convictions in white-collar crime and corruption cases,” Orizio said. At the debate in Nis, the participants were greeted by President of the Supreme Court of Cassation Dragomir Milojevic, Director of the Judicial Academy Nenad Vujic and Deputy Republic Public Prosecutor Zorica Stojsic.